Steve Jobs, Steve Wozniak and ... Ron Wayne? The signatures of all three men appear on Apple's April 1, 1976, incorporation documents. They also appear on a document signed 12 days later, dissolving Wayne of his 10% stake. 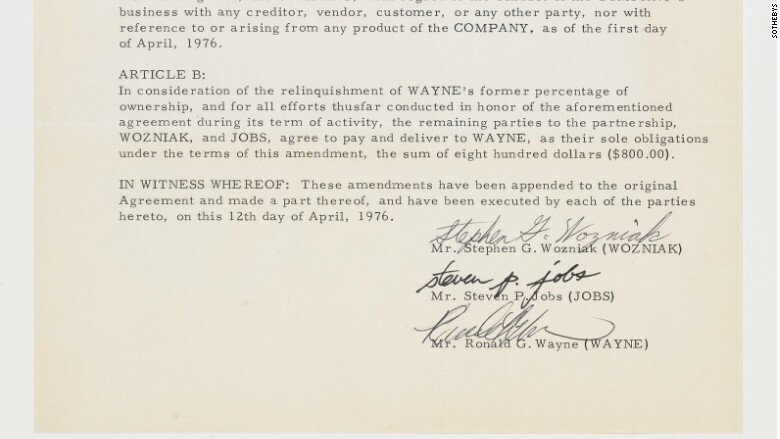 Wayne, Apple's lesser-known third co-founder, signed away his share of Apple for $800. Today, 10% of Apple is worth roughly $62 billion. There's no chance Wayne, who's 81 now, would have been actually been worth anything remotely close to that much today. His stake would have been diluted when shareholders were added later on. But it's not a stretch to say that he would have been a multi-millionaire -- and substantially wealthier than he is now. "What most people know is that I was there at the beginning and walked away; what they don't know is I had very good reasons for doing it," Wayne said in an interview with CNNMoney. "I've never regretted the move." Wayne met Steve Jobs while both were working at video game pioneer Atari. He was a computer programmer, assigned to "assume major responsibility for mechanical engineering and documentation," according to Apple's founding documents. But Wayne wasn't brought in for his engineering prowess. He says he was called in to be the adult in the room. As he sees it, he was given 10% of the company for designing Apple's original logo and mediating disputes between Wozniak and the fiery Jobs. "They were absolute whirlwinds. I was standing in the shadow of giants," Wayne said. 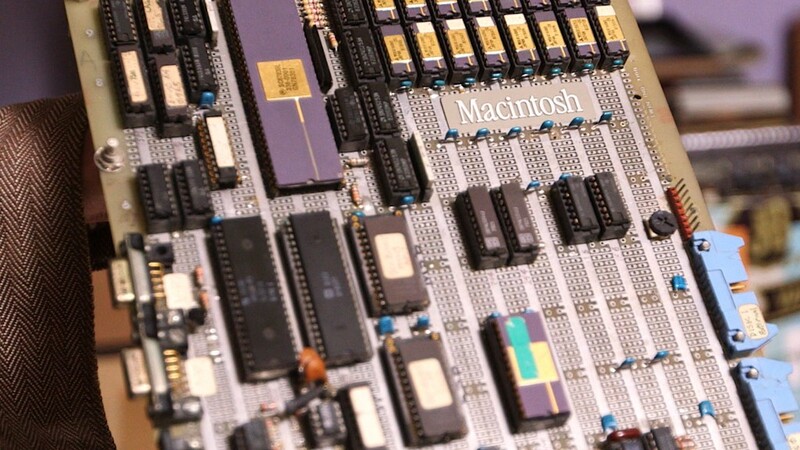 "If I stayed at Apple I would have probably ended up the richest man in the cemetery." Wayne's passion was in the gaming industry, making video games and slot machines. So he says that he wouldn't have been happy at Apple (AAPL). Following Apple, Wayne joined several smaller companies, where he was able to engineer products "soup to nuts." He says he's unhappy unless he has complete control over a product -- something Steve Jobs would have been unlikely to give him. "Once Steve determined where he wanted to be, the last place you would want to be is between him and where he was going, or you'd end up with footprints on your head," Wayne said. "Was he the nicest person in the world? No. That's not the point. The point is what did he accomplish through his journey through life?" Though Wayne admires Jobs for his accomplishments, he lofted most of his praise on Wozniak, calling him "the most gracious man I've ever met." Wayne said that Woz's whimsical attitude was his inspiration for Apple's initial logo, with an apple falling on Isaac Newton's head. Wayne said that he has had a happy life, choosing to do what he loves "for the sake of doing it." He says that he's not wealthy, but he's not "hungry" either. To retire to "a more comfortable situation," Wayne auctioned off most of his original Apple documents -- including his copy of the incorporation papers, a proof of the original Apple logo, and the original manual for the Apple I computer -- earning tens of thousands of dollars. "Would I rather be rich? Of course I'd like a lot of money," Wayne said. "But I have managed. If I just wanted the money, I could have been rich and miserable."